This seems to be the most appropriate photo for the day. Here's a close-up shot of the portela on New York City's very high-profile gondola. By now she's probably out of the water and ready to be shrink-wrapped for the winter. To read more about gondolas in NYC, search "Central Park" in the upper left-hand corner of this blog. At some point I ought to ask Andres about the meaning behind "LAMOTTA", which is written on the sheild. I shot this from the top deck of an enormous cruise ship as we headed out towards the Adriatic. Can you spot the gondola? Now can you see her? She was far, far away, and I was swinging around a 70-300mm lens, with the sun reflecting into my eyes half the time. 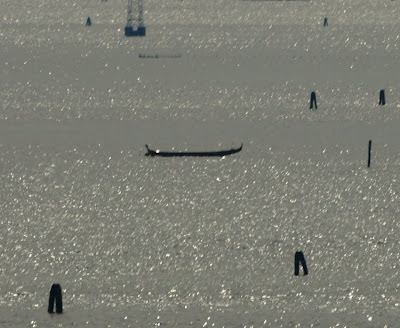 And yet my gondola-obsessed mind caught a familiar shape, and there she was. Most likely a regata boat, she was moored out in the middle of the lagoon, waiting for someone to take her out for a row. 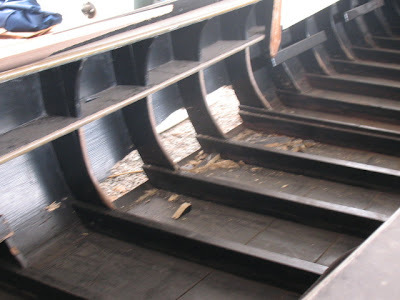 There are few shapes as unmitakable as the hull of a gondola. 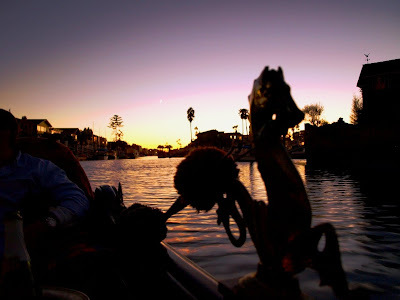 This photo was taken on May 19th, 2008 during the launch of Sunset Gondolas' two new boats. Hoisting and Dipping and Dockside Preparations. 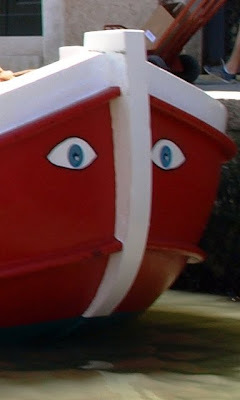 We spend a lot of time talking about rowing boats here on the Gondola Blog. 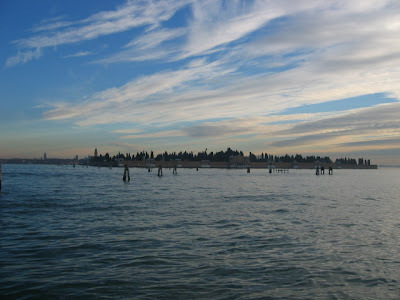 A fair number of my posts also feature places or things in Venice. 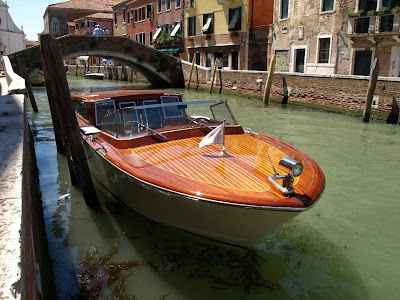 Water taxis have popped up in a few posts but I think this is the first official Venetian water taxi post. 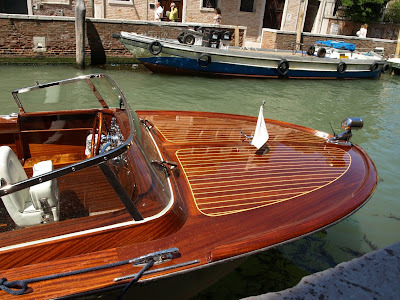 Venice has many iconic boats other than her trademark gondolas. In my mind the vaporetto and the water taxi come in second and third place, and I'm not sure which one is more recognizable than the other. 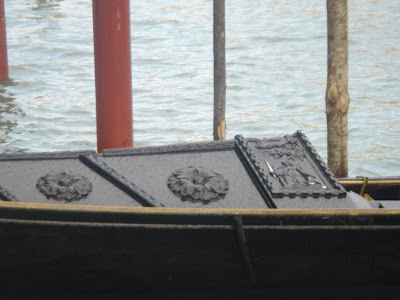 I know there are some who may view water taxis in Venice from a negative perspective. And while I'm certain we would witness a spirited debate if this were a chat board and I simply asked "gondola or water taxi", but I'm not here to foster such arguments right now. 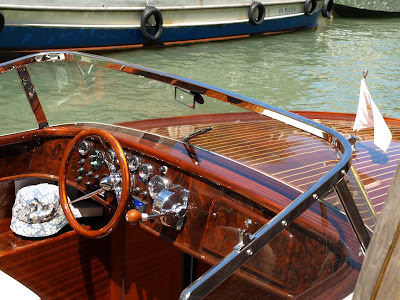 Take a moment and feast your eyes on the beautifully varnished wood that makes these boats so picturesque and memorable. 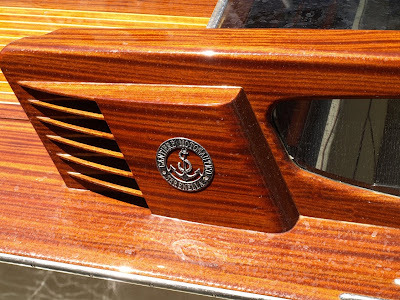 Shiny chrome and burlwood come together to make a dashboard that might just as well be found in a luxury car. 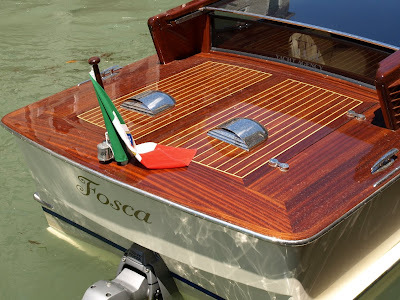 Looking at the transom, we see that she's named the "Fosca". 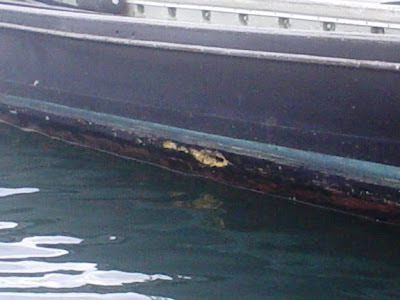 This water taxi has wood decks and structures above the rail, but she also has a white hull and a Volvo Penta powerplant - likely more reliable than the engines that traditionally powered these vessels. "JLT Yacht Agency" is frosted on the rear window. 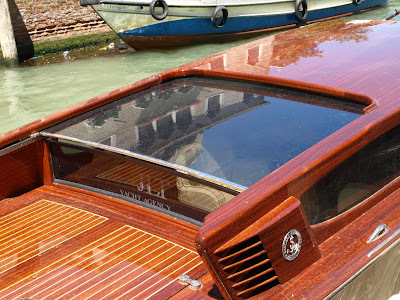 This boat has a clever glass sunroof which appears to slide into the hard roof section. Side vents at the back of the structure have "Cantiere Motonautico Serenella" badges. 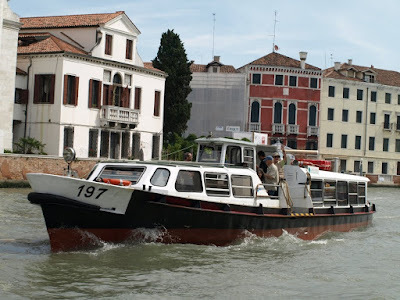 On several occasions Joe Gibbons of Boston told me that entering Venice by water taxi was a "must do". 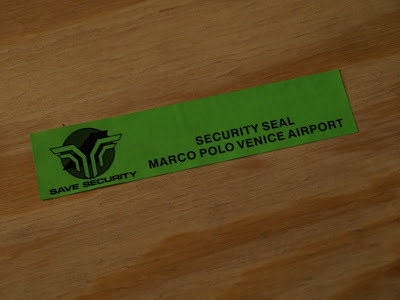 So in 2005, when my family and I arrived at Marco Polo Airport, we flagged one down and jumped in. Joe was right - what a great experience. We had a fantastic tour of the city on our way in, and were delivered (luggage and all) to a spot just steps away from the apartment we had rented for the week. It wasn't cheap, and I wouldn't charter one for other trips around the city, but the trip from the airport quay to our apartment, which would have been a major ordeal using other means, was relaxing and enjoyable. Under close scrutiny, water spots can be seen in a few places. If the owner had known I was going to be snapping photos of his boat, he probably would have buffed them out. But overall, this vessel was darn clean for something I just walked up to and shot pictures of. I shot this back in 2001. Thom Price had some work he needed to do on one of the gondolas. 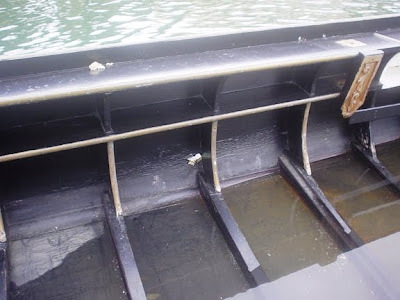 Using two sections of plastic pipe and a dock-mounted roller that was already there, he came up with a clever way of getting the boat up and out of the water. 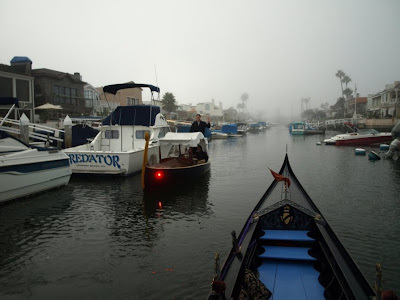 When Sean Jamieson of The Gondola Company near San Diego noticed one of his gondolas was experiencing the symptoms of a leak, he investigated further, and found a wooden boat owner's nightmare. Worms. I've got to give Sean credit here for allowing me to post these photos. There are some problems we, as gondola owners, would rather not share. I know Sean and have seen his tenacious approach to maintenance. If Sean can end up with something like this, any of us can. 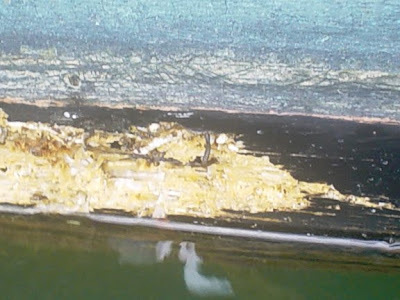 Here's what the inside of the boat looked like when they first discovered that something wasn't right: Here's a close-up of the same spot: After some further poking and prodding, here's what they saw on the exterior of the hull: And a close-up: The culprits here are most likely members of the family Teredinidae. Sometimes refered to as "Teredo Worms", most folks in the english speaking world call them "Ship Worms" - a term used for several species of the waterborne pests. Funny thing about these little buggers - they're not worms at all. 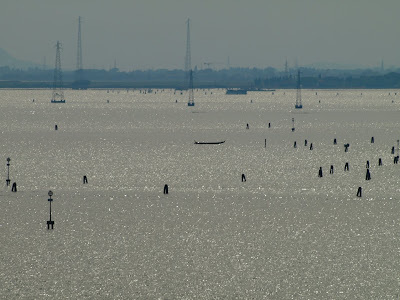 Venetians call them by another name, which when translated means "water termites". They do eat wood, but they're not termites, nor are they members of any insect family. Believe it or not, Shipworms are bivalves; members of the same family as oysters and clams. They are similar in shape to worms, and their digestive tracts can metabolize wood somewhat like termites, but they are molluscs. 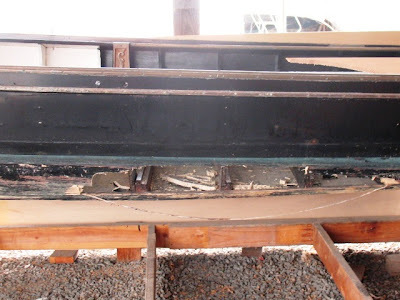 Once I bought a gondola which had a sort of "aftermarket keel" bolted on below the already fiberglassed hull. The previous owner didn't know about Shipworms, and within the first year I found myself removing what was left of that wooden keel. It was one big slimy, stinky mess. As these things eat their way through the cellulose wood, they leave behind calcificate tubes which remind me of the interior of some oyster shells. 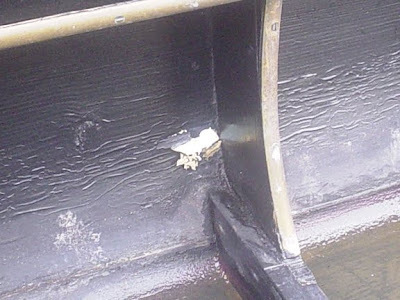 Here are a few photos taken after the gondola had been hauled out and further inspected. What started out as a small area of soft wood became a bigger problem. 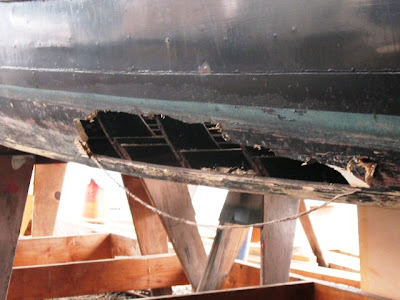 "The hole in the boat you see was created by breaking off pieces by hand, like cracking a graham cracker. One picture is just a small piece that shows all the worm tubes." Here's another view from the outside, showing an interesting angle on the frames inside. And in this photo, we can appreciate the length of the plank in question. I don't envy Sean and the task he has ahead of him. But I can honestly say that there are few people west of the Atlantic as qualified to undertake such a repair. "make sure your diver lets you know when your bottom paint needs replacement". Keep an eye on your boats. 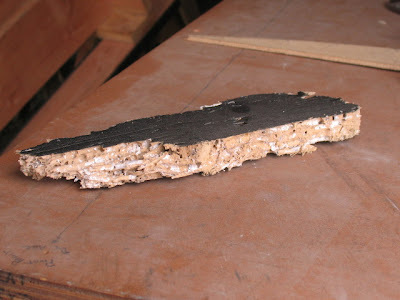 Shipworms can exploit the smallest opening and once they're in, they can be quite destructive. Here in Southern California, we have some fairly predictable winds, and for the most part, we like it that way. We know what to expect, and prepare accordingly. But once in a while we experience a shift. Normally the winds blow from the ocean, but when they start coming in from inland directions, everything changes. Sailors call them "Santanas", most other folks know them as "Santa Ana winds". Usually occurring in Fall or Winter, these winds bring warm, dry air, often fortified with dust, pollen, and everything else found in California's deserts. I should have known they were coming when I awoke this morning and heard our windchimes getting beaten to death by the wind. It doesn't usually get breezy until afternoon around here. I should have known they were coming yesterday when my eyes were itchy and I couldn't stop sneezing. I was pretty sure we had Santa Anas when I shoved off for my first cruise tonight and things just didn't seem right. When I saw a jet coming in to land at John Wayne Airport from the wrong direction, I knew. I've said for years, that "when the planes are landing in the wrong direction, everything else is weird and backwards". So tonight was one of those nights. I met up with my friendly competitor on the water tonight and we both said "did you order these winds? ", then we both laughed. When you're a gondolier in Newport Harbor, and you operate long enough, you get every single square foot of the harbor memorized. Most of our routing is based on winds, so when they shift in the opposite direction, it can really confuse things. I've seen these winds for sixteen years, tonight was among the more extreme. It may not have been so in other parts of Southern California, but in Newport it was a "Bizarro Wind Night". By "Bizarro" I'm referring to the term made popular by DC Comics where something is either twisted or opposite. and while you can't just quit when you're pushing a 36 foot gondola up a veritable wind-tunnel with a single oar, the frustration, muscle fatigue, and other negatives may make you want to quit. Gotta row - harder than ever. I made it through the evening's cruises, got good tips, and became a better rower because of it. Another quote I recently heard comes from Woody Harrelson in the movie "Zombieland"
And while it isn't nearly as eloquent as Lance Armstrong's, it was fitting tonight. "Time to nut-up or shut-up!" Ice cream, vegetable soup, peanut butter, and according to some - deck trim! Nereo Zane has already mentioned this in a comment here on the blog, but for those of you who missed it, check out his video of stills at vogaveneta.it. Nereo Zane just emailed me with some details about the launch of our favorite pupparin. 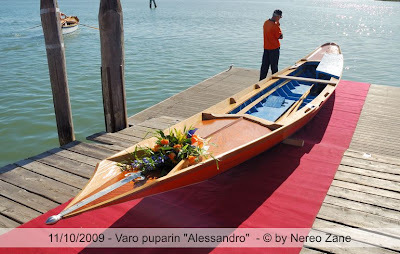 In the interest of "doing it right", the GSVVM chose to wait a month or so to hold the varo because the committee wanted to have it on a Sunday that didn't conflict with any other regate or other special events. 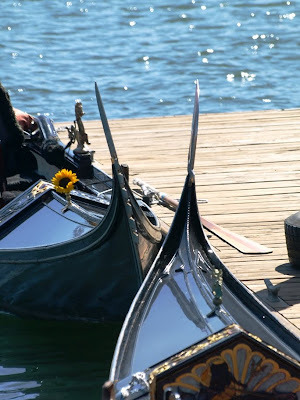 Along with the launch of this special boat, and enjoying a great feast, the club had a couple regate of their own; one for mascarete and one racing gondole. 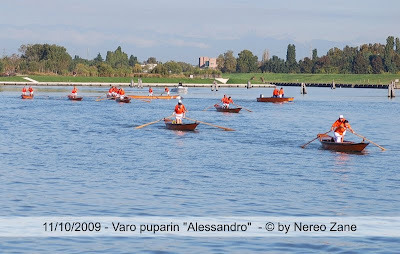 The GSVVM has a regata-worthy fleet of mascarete (which is why the boats in the above photos are all in club colors), but I think they outsourced for the fleet of racing gondole. Hey, I think that's my friend Claudio on the back of that light blue racing gondola! 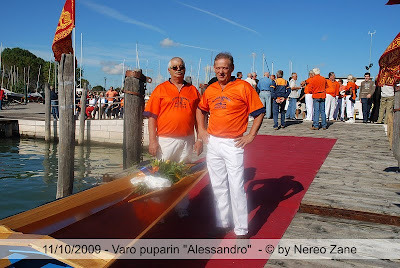 Nereo has just put all of the varo photos in one post on his blog. Check it out, leave comments! 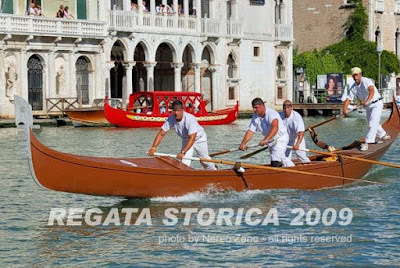 Regata Storica is popular among Venetians for multiple reasons. Some are drawn to it for it's history. Others love it from a nationalistic standpoint - it's a patently Venetian event. Just as the running of the bulls is not only Spanish, but particular to Pamplona. 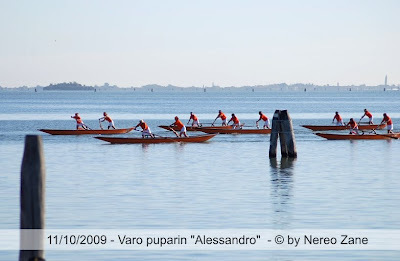 Some Venetians love it because Voga-alla-Veneta is their sport - sure, all of Italy loves calcio (soccer to us Americans), but only Venetians row in the alla-Veneta style (with a few exceptions, of course). 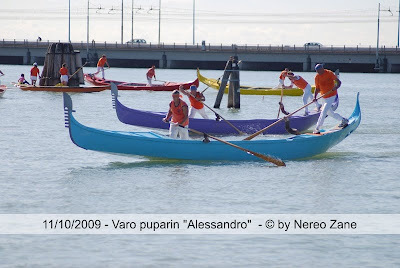 I mentioned in a previous post that the Regata Storica is appealing to Venetians because the competitors are locals. One other draw to mention though, is that there are categories, men, women, boys, groups and clubs. There's a good chance that you'll identify with someone in the field. The women's regata is a big favorite. Women have been racing in Venice for centuries. The first recorded women's regata took place in 1493. 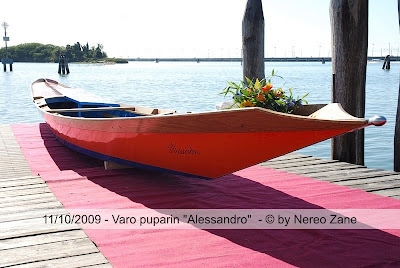 This year, the winning boat was a yellow one rowed by Luisella Schiavon and Giorgia Ragazzi. Here is Giorgia rowing in the forward position. 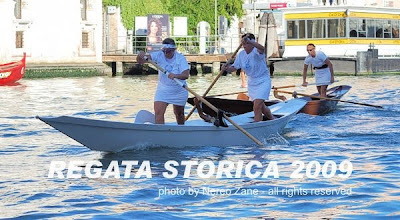 In the white mascareta, Luigina Davanzo and Vally Zanella row in front of Maela Zancan and Elisabetta Nordio in the marron (brown) boat. As a case-in-point, Vally Zanella is a friend of mine and a member on the council of the GSVVM. You know I'll cheer loud for a race that has a "friend in the field". I'd be curious to hear the opinions of others here, because I recall hearing so much cheering from the crowds during the mascareta race, that it almost seemed like the women garnered more noise than the gondolini did. There were some exciting moments this morning. Times photographer Greg Pearson caught some great images of the send-off. See all 21 photos here. 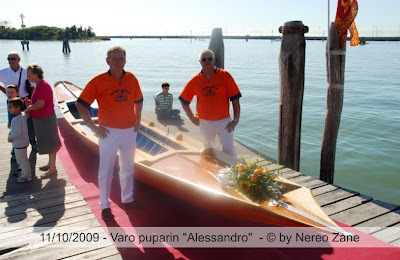 As part of the varo celebration, the GSVVM laid out a feast worthy of a Venetian rowing club. "I've attached a photo of the roasted pork we ate for lunch as second course: more than 1.5 meters in lenght and 90kilos in weight!" 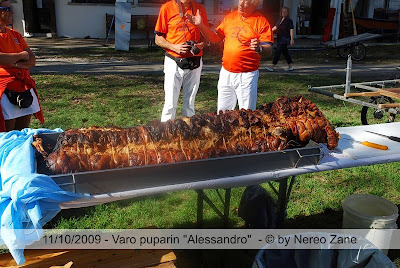 That's club president Bepi Penzo in the background sharing his opinion about the size of the pig (or so I would guess). The drive from Irving to Shreveport was beautiful. East Texas driving always conjures up memories of Smokey and the Bandit, with 18-wheel trucks and two lane highways separated by tree-filled medians. I wasn't driving a Black Trans-Am with a big Firebird sticker on the hood, but that didn't stop me from thinking about the movie and pretending I was Burt Reynolds. We got sun for a awhile, after that the clouds hung low, behaving themselves until about the state line. A little rain fell on the windshield, reinforcing my belief in Murphy's Law. After finding the Lake Patrol base, we launched the gondola, secured her for the night, and went to dinner. I'm currently eating a paneed chicken over spicy crawfish linguini. We're pretty far north, but it's definitely Louisiana. Tonight we eat because tomorrow we row. We flew out to Irving, Texas today to prepare for another expedition - this time in Shreveport, Louisiana. The Boy Scout council in the Shreveport/Bossier area will be holding their annual Scout-o-rama on Saturday, and to direct attention to that event, we will hold a gondola expedition on Friday. 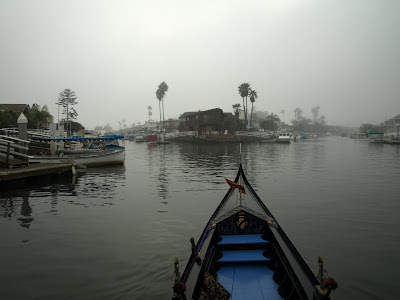 The weather and river conditions have truly conspired against us this time, and forced a change of venue for the expedition. I am nonetheless, quite happy to be doing what I can to help out the Scouts, and look forward to the row. This time I'll be rowing with Matthew Schenk - the current manager of my Irving operation. It will be his first opportunity to take part in an expedition, so the easier venue of Cross Lake is probably a better choice. I am really looking forward to rowing with Matt. Whatever the case, I will probably find myself at one point or another, looking longingly at the heavily swolen Red River, with it's rushing current and large amounts of debris shooting by. "You know, if we really wanted to, we could probably still row that river". But it's not about me, it's about the Scouts. Tomorrow we'll haul the Rosa out of the water and trailer her up from Texas to Northern Louisiana, and prepare for the row on Friday. Last night was idyllic in Newport Harbor. The winds were steady but respectful. 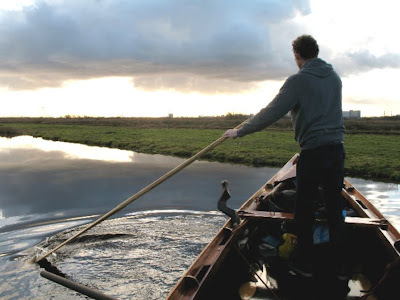 Sometimes the winds give no consideration to a gondolier, treating him like a second-class citizen, but last night the wind seemed to say "I understand your effort, and while I still need to gust here and there, I respect you. Have a great evening". The sky was clear, and after the sun touched down in the distance, we began to notice a thumbnail moon. The progression of colors passed through to whole spectrum, at one point treating us with purple water under a burnt-orange sky. there's no way my camera could truly capture the magic of the perfect moment. I came home today in a hurry. Several months ago I ordered some remi from Franco Furlanetto in Venice. It wasn't urgent, so he took his time, did things the way they ought to be done, and waited for shipping rates to go down before sending. Nereo Zane was amazingly helpful in expediting the process and handling translation matters. Today was "delivery truck day". It's like Christmas for a gondola fanatic. It's nice to have the luxury of time. I've ordered remi and forcole in the past and had to deal with meeting a deadline - no fun, and not easy when the US Customs is involved. I was happy to see things progress without any stress. I don't really have anything against the customs people, but unfortunately sometimes it seems like they have issues with me. In fairness, however, I must point out that when I order remi, they are shipped in a very long box that's fairly heavy. One time I had a comedic exchange with an inspector who pointed out that "a long heavy box could contain one of many dangerous things". 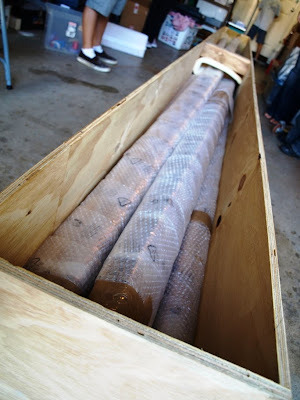 bazookas, rocket propelled grenades, even the rifled barrel for an artillery piece could conceivably rest in such a box. Sure, they'd probably be heavier, but why would anyone want to take a chance? Because of the vigilant work of our customs officials, I have yet to receive anything from Italy in a box that hasn't been in some way "examined". Now "examination" usually involves opening the box to look inside. Sometimes they use tools in the proper way, other times they just crowbar the lid off with little concern for what might be inside. This time the end was crunched in. 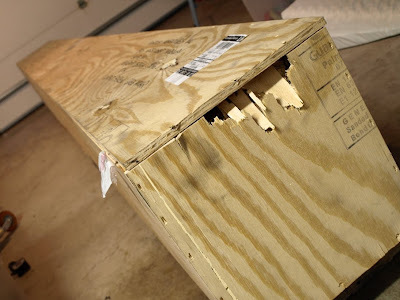 It wasn't much, looked like "shipping damage", but the more likely story is that someone examining the box felt like this hole was big enough to shine a flashlight in to make sure there were no surface-to-air missiles being shipped to Newport Beach. I got a kick out of the Venetian security seal; I'm thinking about varnishing it under a few coats somewhere on a remo. Opening the box, I saw 18 beautiful new remi, neatly wrapped in groups of three and nestled together with the care and pride only a Venetian would put into shipping something like this. The smell came up and filled my head with memories of Franco's shop. It's a mixture of several scents, that combine to make one, unmistakable memory. If you've ever been in a remer's shop, you know the smell. 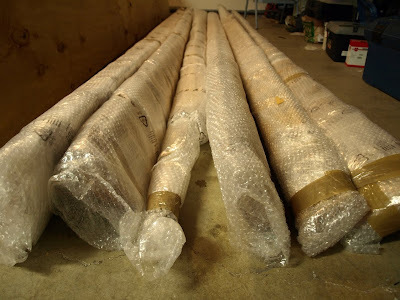 I laid out the remi, still neatly wrapped in groups of three, on the floor for examination. No damage. Everything looked great. Time caught up with me, and I had to run out the door to row a cruise, but when I came back I made a wonderful discovery: my whole garage now smells like Franco's shop. I'm tellin' you, it's like Christmas in October! I talked with John Kerschbaum today and heard about snowfall once again. I asked him to send me a photo. Turns out we've got something better to look at. Here's a newsclip from KSTP channel 5. The cemetary island of San Michele. "Hey Greg, why haven't you posted anything on that pupparin lately?" This is proof positive that all of my readers are patient, well-mannered, and of the highest caliber. Either that or nobody reads my blog anymore. because it certainly makes me feel better than the second. Well I'm happy to announce that our favorite pupparin was just launched on October 11th, with an eventful launch ceremony, known as a "varo". I don't know why the club waited so long to launch the boat, but when they did, they made sure it was done right. As you can see, she's got an official name now: "Alessandro"
That's Maestro Marcuzzi on the left. The guy sure knows how to build a boat. 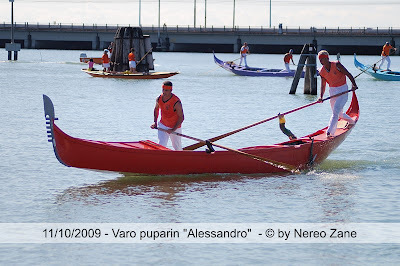 Hans of Amsterdam rowing a poppa in the Veneto. 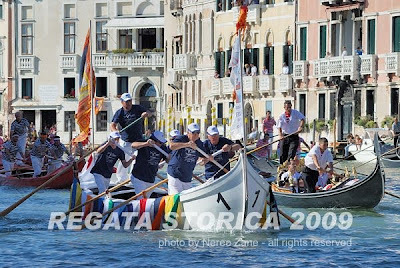 After the parade there are regatas rowed in various types of boats, and while the gondolini tend to take top billing, I love the club race. 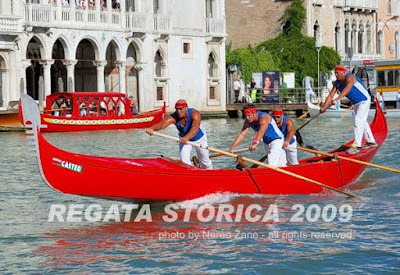 In previous posts I've mentioned racing gondolas, and someday I hope to catch this race on video so I can post it here. Meanwhile Nereo Zane got a couple great shots of this year's race. There are few things as cool as a four-man gondola moving at full speed; she almost looks like she's planing. If you look in the background of both photos you'll see an interesting red caorlina with a hard canopy. There may be more than one, but I think that's the same boat I've seen working out of the San Toma traghetto. 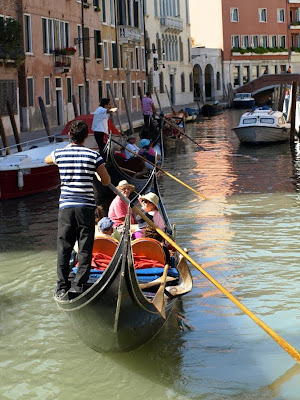 In 2000 my family and I rode as passengers on an evening cruise up the Grand Canal as part of their "Concert in Gondola". The red caorlina had a string quartet and an opera soprano on board. 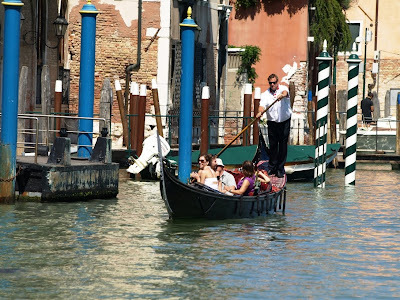 Several of San Toma's gondolas cruised alongside while the quartet played a mix of Vivaldi favorites and pieces the soprano could sing to. Now here's another caorlina moving along quite nicely. It's not part of a race, but those guys look pretty determined. Is it just me or does this guy look just like Joe Gibbons of Boston? Either Joe lives a double life or he's got a twin brother he doesn't know about rowing in Venice. I spent my day in and around town, always in the bright sunshine. It was hot, like in August at times. By the time I dressed for my 6pm gondola cruise, the choice was automatic: summer pants and the striped shirt with shortsleeves. On my way out the door I was sure to grab my sunglasses as well. The weather has been turning toward Fall lately, but today Summer came back...in most parts of town. As I drove down to the docks, the sun was shining, I was actually considering putting a little sunscreen on my nose. Next thing I knew I was driving under clouds and into a fog. 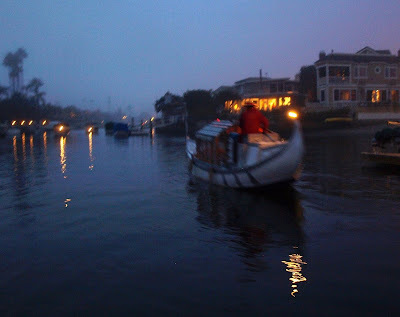 Setting up the boat, I joked with fellow gondoliers about how the fog had snuck in. Everyone agreed that it had been sunny everywhere else but by the water. We call it a "marine layer". It's usually caused by a temperature inversion, and it's quite common around here, but tonight's was especially thick. 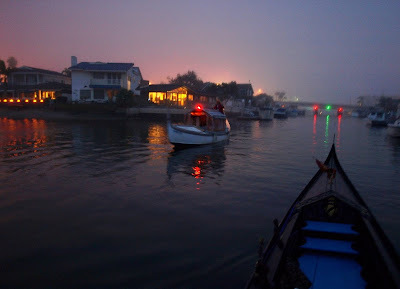 My passengers and I enjoyed the refreshing moisture in the air, and with the occasional concern over getting in a collision with another vessel, I loved rowing in the fog tonight. 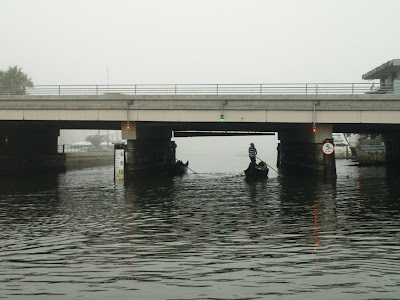 Here are a few shots I took from the poppa: Two gondoliers from my friendly competitor make their way under the Newport Boulevard Bridge. Gondolier Steve O waves from the back of the Serena Lee. Those new halogen nav-lights are nice and bright. ...and heads off into the night.